As our scribe Marina is currently away on her not so well deserved holiday (:D), I'm stepping in to take care of her outstanding interview that she conducted over email with Powerwolf's organ player Falk Maria Schlegel about a month back in time. Without much knowledge to the band myself, I can't really give you an in-depth introduction to the band, but based on the answers we received we are talking about a band of lunatics - or wolfs shall I say. They evidently take their mythological image very seriously, just pay attention to how many times Schlegel refers to the band as "the wolf". RF.net: Hi and thanks for doing this interview! I grant you 10 words; can you please describe your musical style and what you sound like to our readers? Falk Maria: Perhaps we can say it is “Classical Heavy Metal” or “old school heavy metal with a huge doom feeling and rock elements”, yeah, that sounds good, haha. RF.net: Can you tell us a bit about your history? Who is to be credited as the main composer, lyrical writer and so on? Falk Maria: Well the band was formed by accident...or maybe destiny, haha…. That’s now four years ago. Charles and Matthew spent a few days in Romania. Just visiting the country and relaxing. One evening they met that strange guy in a pub. They started talking about music and about their plans to complete an own band. Finally Attila asked them for their phone number, just in case he'd come to Germany. When the guys came back home they had a message on our answering machine. It was Attila Dorn who told them that next week he'd come to Germany to visit some relatives who live there and he'd come around to make some music together. Well, and the rest is pure magic: we started playing music together and it was exactly that special thing we were looking for such a long time. From the first moment on Attila added something very special to our band which goes far beyond his vocals. What the songwriting concerns: We are writing the songs together. There is not a single composer. We do it like the wolves: they are always living in a pride, ha ha. The main influence on the lyrics is our singer Attila Dorn. The reason is his strange past in Romania. And he thinks about it in the lyrics, especially on “Return in bloodred”, influenced by Romanian mythology. But we didn’t want to repeat that. So on the new record the lyrics are influenced by the Bible because “Lupus dei” was quite a spiritual experience. RF.net: If I’m not completely mistaken and confused I remember reading somewhere, someone gave you the title of “Saviours of Heavy Metal”. How do you feel about that title and do you think you deserve it? Falk Maria: Yeah, that sounds good! A good album title! Of course we deserve it! Ha ha. No, it doesn’t matter, if we are the “Saviours of something”. Heavy Metal is not dead! But perhaps, the wolf brings new spirit in the Heavy Metal Scene and I think that is quite important. I am bored of normal Heavy Metal Bands, that’s true! And I love the big heroes like Iron Maiden or Kind Diamond! The music, the visual effect and something like that. Perhaps people drool over Heavy Metal music and visual effects like Powerwolf do, ha ha. We would like it! RF.net: Your band name is Powerwolf, and your album titles are respectively “Return in Bloodred” and “Lupus Dei”; are these titles keywords and representatives for your lyrics? Or what do your lyrical themes mainly revolve around? Falk Maria: First of all the guitarist has the wolf in their names and on the other side, “Return” was influenced by Romanian mythology and the wolf plays the main act there. On “Lupus Dei” it is more the combination between Heavy Metal and religion. Heavy Metal is religion, it is a lifestyle. Look at all the Metal maniacs all over the word. RF.net: You often refer to yourselves as “wolves”. What’s so special about wolves and how does this reference relate to your music/style? Falk Maria: The wolves are living in a pride and aren’t able to exist alone. We as a band can only exist in this combination. There is an invisible magic between the members in this spiritual band. Exactly these bloodred five can celebrate this Metal show and this metal feeling. RF.net: You listed the legendary black/heavy metallers Mercyful Fate/King Diamond as one of your influences, are they also an inspiration to you live as regards the scene show? 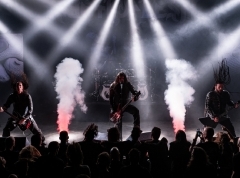 Falk Maria: We love stuff like MERCYFUL FATE, BLACK SABBATH and IRON MAIDEN. Bands that mixed metal with a certain horror feeling and image, just like the wolf does it now. For us Metal demands a horror image. Metal should be evil! As a child I was really frightened of the artwork (as vinyl) of the “piece of mind album”… Great. By the way, we wrote most of the songs wearing our full stage outfits and makeup in rehearsal room to invoke the feeling we have going out on stage. We want to celebrate a Metal show and the great Dan is an influence, of course. But don’t forget: we don’t do that for publicity…so many bands have make up. We do that for our own! But the most important thing is, that you have good ideas and good songs… so the combination of both, that’s for me POWERWOLF. RF.net: I know you’ve been supporting Gamma Ray, Amon Amarth and Brainstorm among others and are invited to play at Summerbreeze Festival this year. These tours led you to perform in front of a lot of people from many different countries. How have you been received by the fans so far? Any great/funny stories regarding that? Falk Maria: It was the best thing in my life. I don’t tell you something new but for a musician is the best thing in life to be on the road. The reactions were fabulous, especially for a newcomer band like us. So many thanks to Metal Blade and Dragon Productions to make this possible. It is very interesting to see the different people in Europe. For example Spanish people are more enthusiastic at Live Shows than German people for example… but the Wolf also celebrated big Metal parties in Germany: So the Wolf combines the different Metal People all over the world to a crowd, who can also snarl like a Wolf, ha, ha. RF.net: Attila, your birthday date is set to 06.06.1666 on the official website, your personal major influence is Vlad Têpes (Dracula), you read and write about Romanian mythology and you dress in medieval clothes – do you feel that you’ve been born to the wrong century or is it just a style preference the band adopted? Falk Maria: Sometimes I really think, that our singer is born in the wrong century… his behaviour, his attitude, his life… Perhaps that’s the reason, that the wolf sounds different. No, but honestly, Mr. Dorn is very introverted… No one is able to explain what is going on, “inside” Mr. Dorn. Perhaps you can help me, when you meet him at a live show…ha, ha..
RF.net: What can we expect from your next album? Any surprises? RF.net: Thanks a lot for taking your time and answering my questions! Keep on howling and we hope to see you run by some venue in Denmark soon. Any final comments for the fans? Falk Maria: YES, IN BLOOD WE TRUST, HALLELUJA! WE HOPE THAT WE CAN SEE US IN DENMARK! CHEERS!